Until the 1930s, the entire segment of Minnesota Point south of today’s Forty-sixth Street South was known by locals as the Barrens. Owned by the federal government since 1856, the area wasn’t as bleak as its name implies. Although most of the sand dunes were covered by beachgrass and a variety of shrubs, it also contained an extensive stand of tall majestic white and red pine trees. The southernmost end of the Barrens was occupied by the St. Louis River Military Reservation, which contained mile marker zero—the point from which all geographic surveys of Lake Superior began. The marker was set in 1823 by Henry W. Bayfield of the British Royal Navy (and namesake of Bayfield, Wisconsin). In 1852 the U.S. government sent surveyor George Stuntz to the Head of the Lakes to survey western Lake Superior. Stuntz, a pioneer of both Duluth and Superior, Wisconsin, augmented his living by trading with the local Ojibwe who summered on the Point. He established a trading post and dock north of mile marker zero on the bay side of the Point. In 1858 the U.S. government built the Minnesota Point Lighthouse on this portion of the Barrens to serve mariners using the natural Superior entry between Minnesota Point and Wisconsin Point. Legend has it the fifty-foot tall lighthouse was constructed directly over mile marker zero. When thick fog rendered the light useless, original keeper R. H. Barrett blew a warning through a logging camp dinner horn; local residents called it Barrett’s Cow. The lighthouse was rendered all but unnecessary in 1871 when the Duluth Ship Canal was created, allowing vessels headed for Duluth to bypass the Superior entry. Traffic through the entry became so rare that the government closed the lighthouse in 1885. The keeper’s house was abandoned in 1895 and torn down soon after. The lighthouse still stands, albeit in ruins. The Superior Water, Light & Power Company purchased a segment of the Barrens in 1889. The property (just south of the Sky Harbor airport) contains a pump station built to provide fresh water to the city of Superior from an intake pipe reaching far into Lake Superior. The city of Cloquet, Minnesota, also pumps water from this area. The Walter Stock Pump Station #1 sends Lake Superior water twenty miles to provide Esko, Carlton, and Cloquet with auxiliary reserves of fresh water for industrial use and emergencies. The federal government built the U.S. Lighthouse Service Depot south and west of the Minnesota Point Lighthouse in 1905 to store buoys and calcium carbide. The carbide was brought to the Duluth Ship Canal’s North Pier Lighthouse, South Pier Lighthouse, and Inner Harbor Light. Water dripped onto calcium carbide created acetylene gas, which powered the lights. The U.S. Corps of Engineers did not want to store the raw material for a dangerous gas close to Canal Park and the aerial bridge. So the vessels Amaranth and Marigold loaded and unloaded calcium carbide and other supplies at the building from 1905 until World War II, when the lights were electrified. Today, the ruined building’s walls are covered with graffiti, and there is evidence it has been used as a party location for decades. The same year the buoy depot was constructed, saw the great storm of November 1905, also called the Mataafa Storm. As the storm raged, Lake Superior’s waves crashed along the Point, striking the Barrens south of Oatka Beach particularly hard and opening a channel nearly two hundred feet wide through the sandbar. By mid-December, the shifting sand had sealed the breach. The 1930s saw a dramatic change when the City of Duluth acquired all but the southernmost portion of the Barrens and brought in 150,000 cubic yards of fill to create the Minnesota Point Recreation Area. As World War II erupted and the buoy station became obsolete, the federal government built a seventy-acre seaplane base south of the recreation area’s amusement park, again expanding the point with fill. In 1946 the seaplane base became Sky Harbor Airport. 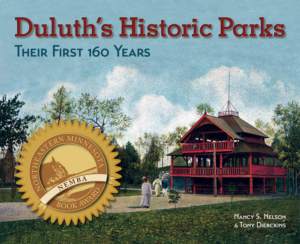 By then Duluth had acquired rights from the federal government to occupy the fifty acres of the military reservation at the very southern end of the point for recreational purposes. City officials intended to use it for Boy Scout and Girl Scout groups and planned to convert the former buoy warehouse and dock to a Sea Scout base. That idea never materialized. Instead, the area remains undeveloped except for the Minnesota Point Nature Trail that circles through the property. As of 2016, the ruins of the lighthouse and buoy station still stand. In 1974 the lighthouse ruins were placed on the National Register of Historic Places, but other than installing a chain-link fence around it, nothing has been done to protect or preserve this first lighthouse at the Head of the Lakes. But that may soon change. In 2015 the Lake Superior Marine Museum Association announced the Save Minnesota Point Lighthouse project, hoping to preserve the iconic landmark.